I love this poem! It’s so beautiful. 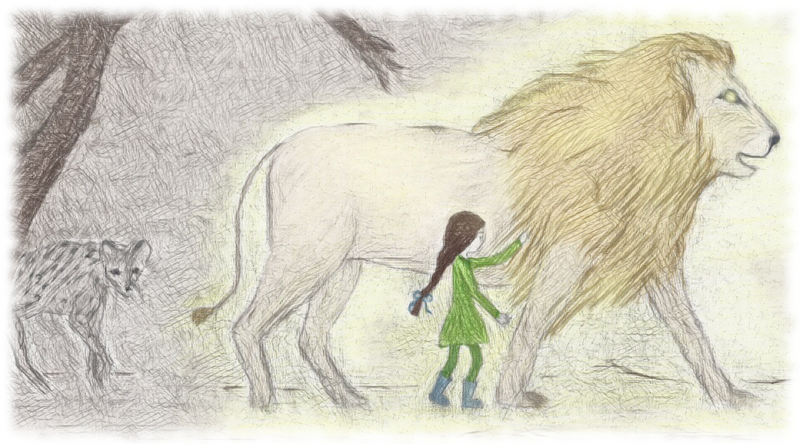 — This was not only inspired by Aslan and the stories of Lewis, but by an account in Helen Rosaveare’s ‘Living Faith: Willing to be Stirred as a Pot of Paint’ — where she speaks about walking by a young armed militant in darkness and how afraid she was, but how she told him that a lion walked at her side. Her book is not by and large suitable reading for children (though I think some of the accounts would be suitable to share), but very faith-bracing, albeit at times very difficult, for grown-ups. Thank you for this. Of course, I’m reminded of The Horse and His Boy, when Aslan guides Shasta along the mountain path in the dark. That’s one of my favorite scenes in all of the Chronicles. Yes, that is the very Aslan moment I was thinking of. I love that scene very much, where he reveals that all the lions Shasta has been in dread of were himself. It is my favorite moment in Narnia.